The Fair of Tourism is celebrated on Saturday and Sunday in the Hangar 14 of Bordeaux from 10.00 to 19.00 hours and with night markets until 23.00 hours with 60 stands, gastronomic spaces and entertainment shows. Bordeaux celebrates the Festival “Basques á Bordeaux” from 22 to 24 March and Destinations Euskadi, with the collaboration of the Department of Tourism, Commerce and Consumption of the Basque Government, will be present. In particular, this Friday Day 22 start the professional meetings dynamized by journalists from SOUTH OUEST and the institutional roundtable of the Euroregion, the Region Nouvelle, which will participate Destinations Euskadi. On Saturday and Sunday the activity is centered in the Hangar 14 of Bordeaux, next to the bank of the river, where the Tourism Fair is celebrated from 10.00 to 19.00 hours and with night markets until 23.00 hours. A fair open to the public in which 60 stands participate, among which are Destinations Euskadi to make known its tourist offer, including gastronomic spaces and entertainment shows. 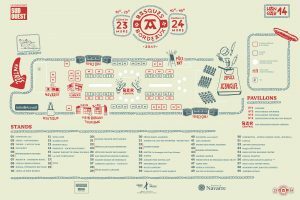 A festival that brings together tourism, artisans and gastronomy has as its main idea to show the power of Basque territory and make you want to visit it. To achieve this, Bordeaux offers a showcase during the weekend that favors economic, cultural and tourist exchanges. These days there will be an immersion in the heart of the Basque Country with its art, culture and gastronomy. Throughout the weekend bands, choirs, Basque sports and traditions will animate the hangar and make discover the richness of the Basque heritage. On the other hand, pintxos, ciders, wines and beers will be served to taste Basque products. This will be a privileged moment with prestigious chefs cooking live recipes.